While cosmetic dental procedures are becoming increasingly common in North America, this is not the sole reason for relying on tooth crowns. Dental Crowns or teeth caps are all a way of helping preserve teeth. Approximately 72% of all Americans have crowns or fillings. In 2006, the American Academy of Cosmetic Dentistry (AACD), says their members performed 1.85 billion of these dental procedures! This process has been going on for centuries. The two – esthetics and necessity have tended to intermesh since the Etruscans began making tooth crowns from ox bone, ivory, and human teeth. Gold became popular and, over the centuries, the practice evolved. As the 18th century came to an end, people had become weary of ivory dentures. French dentist Nicholas de Chemant addressed the need by creating porcelain teeth. This eventually led to the first porcelain jacket crown invented by Charles Land in 1905. Late improvements produced porcelain-fused-to-metal crown first then all-resin crowns. Yet, what is a crown? Dental crowns are a manufactured dental appliance. Also known as “caps,” they act as a covering or restoration for a defective tooth. The placing of this device is always over top the original tooth, although crown is also a term applied to the covering of a dental implant. Crowns serve two basic purposes. They act to help preserve, save or conceal a weak or destroyed tooth. A crown may also be added to improve the esthetic quality of the tooth becoming a part of a cosmetic dental surgery procedure. The utilization of a tooth cap, therefore, is practical but can also satisfy the perceived need to improve a smile. When completed, dental crowns may last up to 30 years. It depends upon the care taken as well as the material comprising the crown. In general, the average life span is 10 years. A dental crown is one means of preserving a dubious tooth. 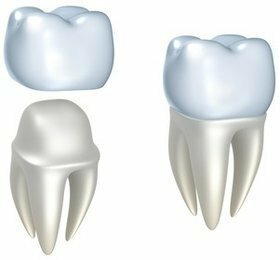 If taken care of, tooth crowns can help us keep our teeth longer. Dental crowns also act as a means of improving our smile. Capping teeth or as part of an implant, they go a long way to helping us smile for years. In many instances, a tooth crown is truly a crowning touch.